IN 1954 AN AMERICAN INTRAMURAL SPORTS PROGRAM KICKED OFF IN THE UNITED STATES ARMY OCCUPIED TEMPELHOF-BERLIN CENTRAL AIRPORT, LEADING TO COMPETITIVE VARSITY CROSS-COUNTRY, BASEBALL, BASKETBALL, SOFTBALL, SOCCER, AND VOLLEYBALL TEAMS. THEIR NAME? THE BERLIN BRAVES. WITH THE WITHDRAWAL OF AMERICAN FORCES IN BERLIN CAME THE END OF THEIR SPORTS PROGRAM. THEIR MEMORY, HOWEVER, REMAINS IN THEIR ICONIC SPORTS LANDMARKS - THE BASKETBALL GYM LOCATED ABOVE THE ABANDONED TEMPELHOF-BERLIN CENTRAL AIRPORT ENTRANCE HALL AND THE TEMPELHOF “FIELD OF DREAMS”. TWO LOCATIONS WHICH DECADES LATER WOULD BE BROUGHT BACK TO LIFE WITH THE REVIVAL OF THE BERLIN BRAVES. THE NEW BERLIN BRAVES PATCH IS A TRIBUTE TO THE ORIGINAL INSIGNIA OF THE BERLIN BRIGADE - A BRIGADE CONSISTING OF ALLIED FORCES LOCATED IN BERLIN AFTER THE END OF WWII. BY ADDING THE BERLIN ARC ABOVE THE U.S. ARMY EUROPE BADGE, THE BERLIN BRIGADE PATCH WAS ESTABLISHED. 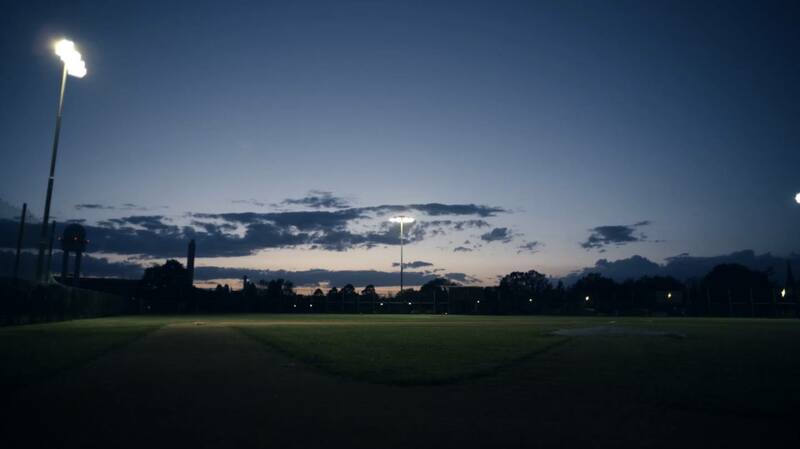 ‘THE FIELD OF DREAMS’ ON TEMPELHOFER FELD - ICONIC LANDMARK OF THE ORIGINAL BERLIN BRAVES BASEBALL TEAM FORMED BY THE U.S. ARMED FORCES. WHERE IT ALL BEGAN, AND WHERE THE STORY WILL CONTINUE. WITH US. THE BERLIN BRAVES. PROUDLY WEARING THE NEW BERLIN BRAVES PATCH ON OUR UNIFORMS, OUR TEAM SALUTES THE MEMORY OF THE BERLIN BRIGADE EACH TIME WE WE SET FOOT ON THE DIAMOND.